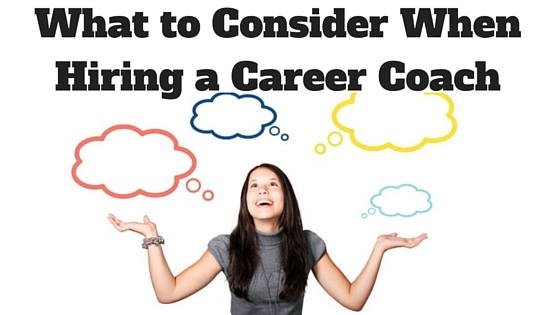 Ready to hire a career coach? Here’s what you need to know to find the right coach for your situation. Hiring a coach to assist and support you in your career can be one of the wisest investments you’ll make in today’s ever-changing world of work. Depending on your needs, you might find that coaching is your bridge to more motivation and fulfillment on the job, better performance (and recognition), jumping ship for a brand-new career or navigating your way through a tough job search. But how do you know when it’s time to work with a coach—or how to go about finding one who will be a good match for you and your goals? What you need—and want—from a coach has a lot to do with where you’re at in your career. Are you just starting out? Looking to transition out of a dead-end job into more meaningful work? In love with your profession, but feeling burned out in your current role? Ready to move up the ladder in your organization or a similar one? Maybe you’ve achieved your goals and you’re ready to use your experience and skills in a whole new way. Perhaps you’re coming back into the workforce, but you’re not sure what you want to do. Understanding where you stand will help you choose a coach whose approach and methodology is a good fit for you. What specifically do you want help with? So, you know where you’re at, but where do you want to go? You may not have the answer yet (and if not, a coach can help you find it), but chances are that you do have some ideas about what your first steps or desired outcomes might be. Are you focused on short-term or long-term goals (or both)? If you need to find a job yesterday, your approach— and potentially the coach you choose— may be a lot different than if you’re employed and contemplating a transition into more meaningful work. Long-term goals, such as identifying your career path or finding what’s next for you, require time to explore your options and dig deep into who you are, what you’re great at and what kind of work and lifestyle are important to you. Short-term goals such as refining your resume or improving your job search strategy may or may not play into your long-term career goals. What do you expect of your coach—and of yourself? When you are stuck, a coach can help get you moving again. A coach can support you in preparing for a promotion, conducting a job search, transitioning roles, or even launching a business. A coach can help you position yourself for new opportunities in your workplace. However, unless she is doing the hiring, your coach cannot guarantee you a job or a promotion or tell you what career path you should follow. Coaching is a partnership designed to support you, challenge you and hold you accountable as you develop and achieve your career goals and vision. While your coach will offer valuable assessments, tools and assignments, resources and a safe, confidential sounding board, it’s up to you to choose where you want to focus. You’ll get the most from your investment when you’re prepared to fully engage, put new ideas into action and use the support and accountability of a coach to your benefit. Every coach has his or her own methods for helping you achieve your stated goals or set new ones. However, some coaches follow the same step-by-step process with every client they work with. Others take a more customized or intuitive approach to career work, choosing what they believe to be most effective for that individual. Neither is right or wrong, but it’s worth thinking about which approach is most aligned with how you work best, what motivates you and what you want to accomplish. Many career coaches belong to professional organizations and/or hold a credential from a governing body, such as the International Coach Federation (ICF) or the Center for Credentialing and Education (CCE). While credentialing is not a requirement for career coaches, it signifies that the coach has met training and mentoring requirements, keeps current in their professional development and has agreed to abide by codes of ethics and confidentiality. If that matters to you, consider hiring a credentialed coach. Once you’ve answered these questions, you’ll find it easier to find a coach who’s a good match for you. And when you do your homework upfront, know what you want to get out of coaching and show-up fully for the process, it’s an investment that can transform your career.